What a day for Irish cycling. ON A TRULY memorable afternoon in Rio, Ireland won two Paralympic cycling gold medals as Katie-George Dunlevy and Eve McCrystal followed Eoghan Clifford in claiming Time Trial glory. The tandem pair blazed to victory by more than half a minute after completing the 30km circuit in a time of 38:59. Nobody could get near them. Dunlevy and McCrystal used their track disappointment to fuel their fire and it showed as they left their closest rivals in their wake en route to a first major title as a pair. “That’s the first time I’ve heard that – Paralympic champions – it sounds nice, I’ve been dreaming of that for a long time, dreaming of that for the last four years since London,” McCrystal said. It capped a stellar day for Team Ireland as they added four medals to the overall haul after Colin Lynch and Eoghan Clifford won silver and gold respectively before Ellen Keane won bronze in the pool. 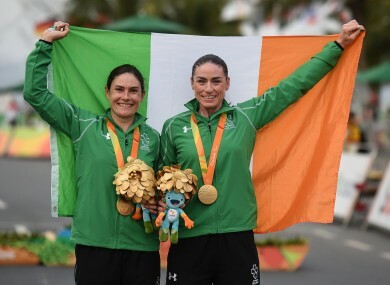 Email “Gold rush for Ireland as Dunlevy and McCrystal complete memorable afternoon in Rio ”. Feedback on “Gold rush for Ireland as Dunlevy and McCrystal complete memorable afternoon in Rio ”.